At the cradle of TA in the 1960s stood the need for better informed decision making about S&T as well as the fact that science and technology no longer were uncontested in society and S&T development gave rise to debates and conflicts. Thus the discourse on concepts and methods of TA always circled around the question of how and which expertise has to be engaged in TA procedures and as well on how (and to which extent) social interests or the view of the public must be included in the process. TA has always been driven by these two impulses (Guston/Bimber 2000). One impulse drives towards expert analysis and the other one drives towards public deliberation. Accordingly two models or concepts of TA have been pursued throughout the history of TA: a policy analysis model and a public deliberation model. When the Office of Technology Assessment (OTA) at the US congress was established in 1972 the policy analysis model was predominant, but nevertheless involvement of stakeholders and public interest groups always played an important role in OTA studies. The fact that during the 1980s and 1990s in Europe the deliberation model gained importance and can nowadays be regarded as being dominant in many European countries has to be seen against the background of major shifts in the relation of science and society which has been reflected in the social sciences in terms such as “reflexive modernization” (Beck et al. 1994), “Mode 2 knowledge production” (Nowotny et al. 2001) and others. The “deliberative turn” thus can be understood as a reaction to specific problems of dealing with uncertainties or ambiguities in practical, normative and ethical problems that unavoidably arise from technical modernization and cause problems to legitimize policy making (Hennen 1999). At the time when the OTA was closed (Herdman and Jensen 1997, Hill 1997), TA – as an import from the U.S. – had already become a major success in Europe. Today the European Parliamentary Technology Assessment Network (EPTA) comprises 12 national parliamentary TA institutions and the TA body of the European Parliament and another five associate members with working relationships to their national parliaments. Parliamentary TA in Europe took up the heritage of the OTA but differs in many respects from it, organizationally as well as with regard to methodologies and mission (Vig & Paschen 1999). Different institutional models are being followed in different countries, depending on their political or parliamentary traditions and cultures. In some countries, (e.g. Italy, Finland, and Greece) parliamentary committees for TA have been established which (according to their agendas) invite experts to meetings or organize workshops and conferences in order to gain scientific support for their debates. In the case of France the individual members of the committee carry out TA studies on their own and deliver the results in the form of reports to their parliament. In other countries parliaments have chosen a model of institutionalization that is closer to the OTA type. The parliament then runs a scientific office on a contract basis with a scientific institute (e.g. in Germany and at the European Parliament) or as part of the parliamentary administration (e.g. in UK) to which TA studies are commissioned according to the information needs of the parliament. These studies may result in short parliamentary briefing notes or in fully fledged TA reports, which draw on in-house research and also on input from a number of external scientific experts and stakeholders. A third type of parliamentary TA bodies is characterized by close cooperation between parliaments and external independent institutes (in some cases related to the national academies of sciences) that support parliamentary deliberations with policy reports and organization of workshops or hearings. Often this kind of arrangement involves an additional – interactive – mission of the institute which opens up the classical (OTA-like) TA setting of experts and policy makers to an additional third party: the general public. The mission of TA then is not only to support politics by providing in-depth and unbiased analysis of possible effects of science and technology on society, but also to inform and intervene in public debates (e.g. in Denmark, the Netherlands, Switzerland, Flanders and Norway). This kind of orientation of the consulting process towards the public, stakeholders, societal groups and citizens, can be regarded as the European “improvement” on the classical TA model. The public is not only involved as an object of research, but as an actor in the TA process of his own rights. 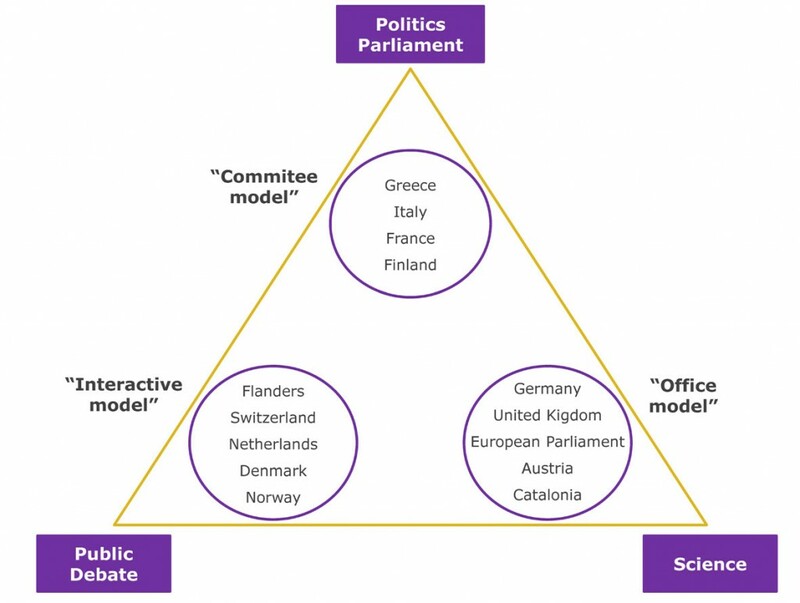 Against the background of these three models of institutionalization – the “committee”, the “office“, and the “interactive” model – it has to be stressed that – independent of the model applied – TA always plays an intermediate role with regard to three societal arenas: science, politics and the public sphere (see figure “The intermediate role of Parliamentary TA in Europe”, Hennen/Ladikas 2009). Any TA institution has to position itself in this triangle. And even the more “classical” model of scientific policy consulting does not imply a “closed circle” type of policy advice where experts and policy makers negotiate behind closed doors. The TA process must always be transparent to the general public – in particular for social groups that have a stake in the issues to be dealt with. On the other hand, TA with a focus on intervention in public debates – by e.g. organizing citizen conferences, setting up lay panels or public stakeholder meetings – cannot function without backing from independent scientific expertise and will be politically meaningless without involvement of related policy making bodies. The acknowledgement that a comprehensive assessment of new technologies is dependent on the values and interests of social groups, has led technology assessment to try out a large number of participatory formats of evaluating technology, in which experts, lay persons and political decision makers cooperate in various ways. During the last decades participatory approaches gained particular relevance in TA (see contributions in Joss & Bellucci (eds.) 2002). This is partly due to growing awareness of shortcomings of a “technocratic” TA approach, which was based on the (at least implicit) assumption that TA could deliver solid scientific knowledge about future developments, thus giving definite advice to decision-making. The history of TA thus can be seen as a learning process on the limited possibilities of improving planning and programming in political decision making through scientific knowledge and the need to involve science, society and policy making in a dialogue about socially sound ways of S&T development. TA thus is as much about “evidence based policy making” as it is about “public engagement in science and technology”.